One day in the 7th Century AD a great earthquake in the Red Sea rocked the sea bed and created a tsunami so powerful that it travelled over six kilometers inland and completely wiped off from the face of the earth the ancient African city of Adulis, capital of Punt, “Land of the Gods” or “God’s Land”. Adulis, built in the dry stone method, was an extensive city that existed for thousands of years before the giant wall of water sent it stones and inhabitants alike tumbling inland and then back out to sea, that which would float. Today all that remains of Adulis is windblown sand filled foundations and stones, stones everywhere, scattered suddenly by a cataclysmic event so powerful it even erased history. The story of Adulis is just now being uncovered with the discovery of another great Red Sea earthquake and a biblically related tidal wave that destroyed an ancient civilization. 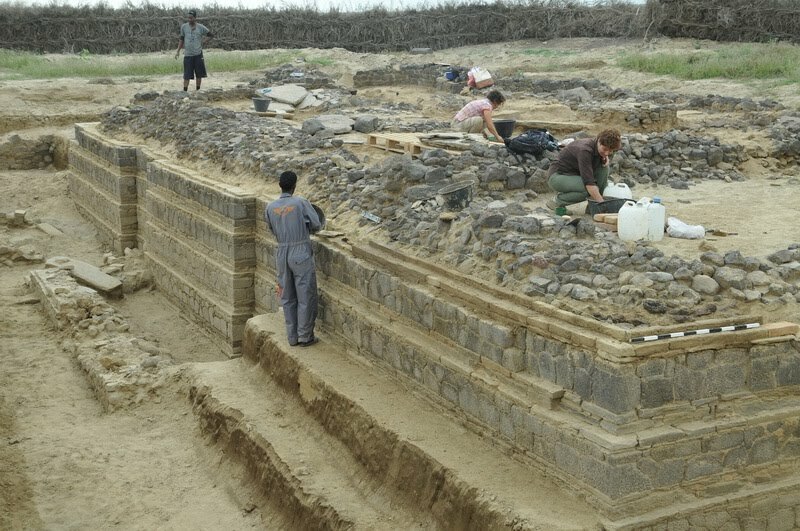 What Italian archeologists digging in the soil of ancient Adulis, Zula Bay, Eritrea, found was evidence of this greatest of marine disasters, profound because it struck so suddenly, without warning scrapping all and asunder before it and leaving no trace of what it had destroyed. We know from the ancient Egyptian mummified baboons that baboons living near the remains of Adulis are the closest match found in East Africa settling the question once and for all with undeniable scientific evidence that today’s Zula Bay in Eritrea was the ancient “Punt, Land of the Gods”. Or so say the ancient Egyptian sarcophagi that held the mummified remains of the ancestors of today’s Eritrean baboons. Adulis, capital of “Punt; Land of the Gods” as it was almost always written (maybe “Gods Land”?) was a maritime civilization first recorded in history during the 5th dynasty of ancient Kemet, what is todays Egypt. It was a critical re-watering point on any maritime journey down the Red Sea coast on the way to and from the fabulous riches of the East, India and China. To this day sailors stick to the African coast of the Red Sea when traversing this most salty of waters and half way down the coast or so a legendary underground river fed Adulis, so plentiful that it supported thousands of inhabitants, or at least the preliminary surveys seem to show. “Punt, Land of the Gods” was famous world wide for being the home of sweet myrrh, Comophora Erytraea, the sacred oil used to anoint the bodies of the Pharaohs so they could pass into the afterlife. The word Kristos in Yesus Kristos means “the anointed one” as in anointed in sweet myrrh oil, the source of which is still growing in today’s Eritrea. “Ethiopian Gold” from the highlands, ivory and ebony from the lowlands, Onycha (snail nail/operculum shell), the sacred binding agent once used in holy incense found only along todays Eritrean coast and of course, Red Sea salt, white gold, used for currency even, from the salt fields in what is todays port city of Massawa. Maybe someday, when more digging brings more history to light the world will find out more about Adulis and how a great civilization disappeared from history without a trace, erased by a massive wall of water obliterating everything before it and leaving nothing behind but the writings of a few ancient texts. The author has authored 133 publications on Modern Ghana.